Hurry! 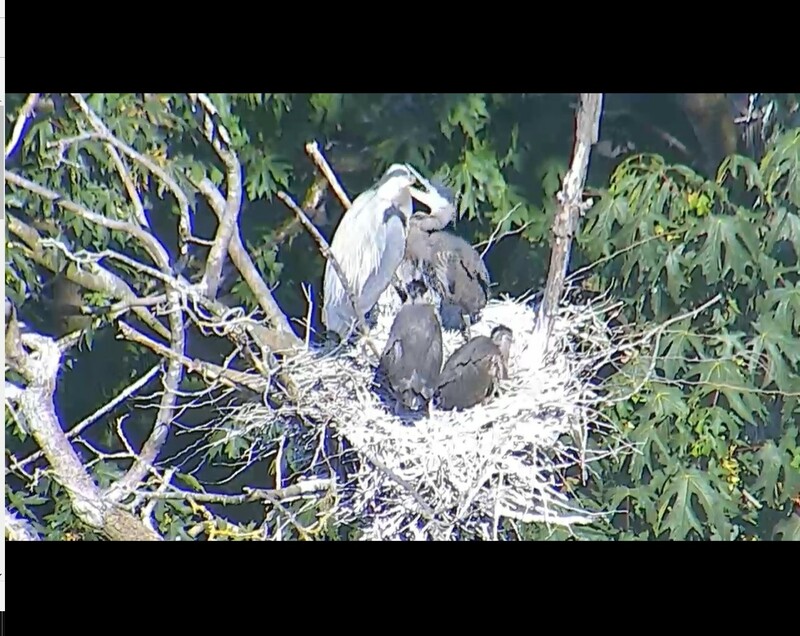 See the Heron Chicks Before They Leave! Featured » Hurry! See the Heron Chicks Before They Leave! They grow up so quickly. Oh, how time flies! Our heron chicks are more than half-way through their nesting season. Heron chicks typically take about 60 days to grow from hatching until fledging. The earliest chicks were heard and observed at the colony on May 9th (with the majority hatching over the next week or so). That puts our oldest chicks at about 6 weeks of age. By this time next month, many of our chicks will have flown the roost. As the chicks get ready for fledging, they start branching out of their nest. This last stage of growth is aptly named the “brancher” stage. At this time, chicks hop from limb to limb while practicing their short flights. They can frequently be seen vigorously flapping their wings to build their flight muscles. Look for these signs of growth on the Vancouver Park Board’s Heron Cam as we head into the final weeks of this breeding season! If you see any of these awesome events, share it using #HeronTalk. Stanley Park Ecology Society continues to provides live nature interpretation at the heron colony every week. Check our social media feeds for dates and times.